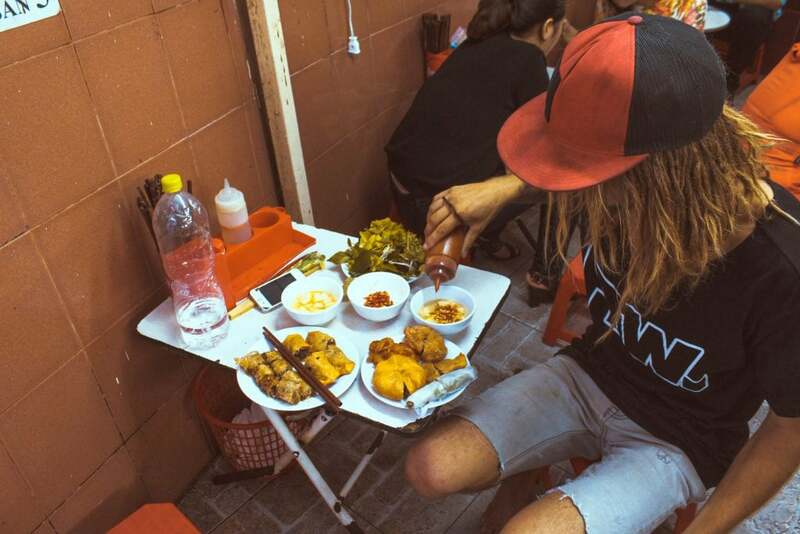 The street food in Vietnam is like nothing you’ve ever seen or tasted before. Vietnamese cuisine balances sweet, sour, salty and heat to deliver a truly unique culinary experience. Vietnam food is obscure and strange, yet food from Vietnam just tastes so damn good. The typical Vietnamese food combines the zest from citruses like kalamansi or tamarind, fermented fish sauce, birds eye chilli’s, fresh herbs and cane sugar. Pho and Banh Mi’s are probably the most famous food of Vietnam, however, there are so many more delectable Vietnamese dishes that you have to try! One food in Vietnam that you probably want to avoid is ‘Thit Cho’ aka dog meat. Dog is one of the bizarre foods Vietnam has to offer however, it’s a delicacy eaten for ‘luck’. Don’t worry, they don’t swap out the meat in your Vietnamese dishes for dog, as it’s much more expensive to buy. 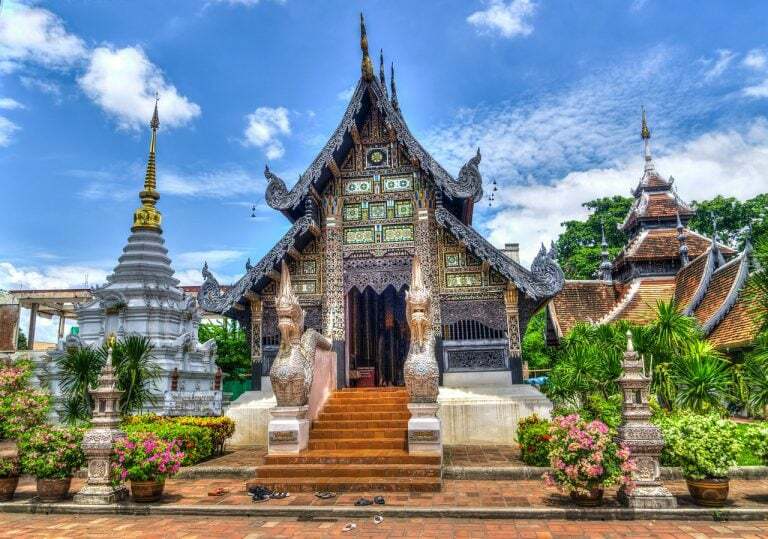 If you’re off to Vietnam check out our Ultimate Vietnam guide with absolutely every quintessential detail you need to know and the best things to do in Vietnam. Keep reading to find out the 13 best food from Vietnam! Food in Vietnam is quite a social occasion! Are you really in Vietnam if you’re not eating typical Vietnamese food for breakfast like Pho? This simple staple Vietnam food consists of a salty broth, fresh rice noodles, a sprinkle of herbs and your choice of beef (bò; most popular), chicken (gà) or vegetarian (ăn chay). It doesn’t matter where you are in Vietnam, you’ll be able to enjoy a hot bowl of Pho while enjoying your Vietnam itinerary. You’ll be sitting on a plastic stool and at a table that’s about the right size for a 7-year-old child. This delicious food in Vietnam is cheap, tasty and pretty much available everywhere, all hours of the day. 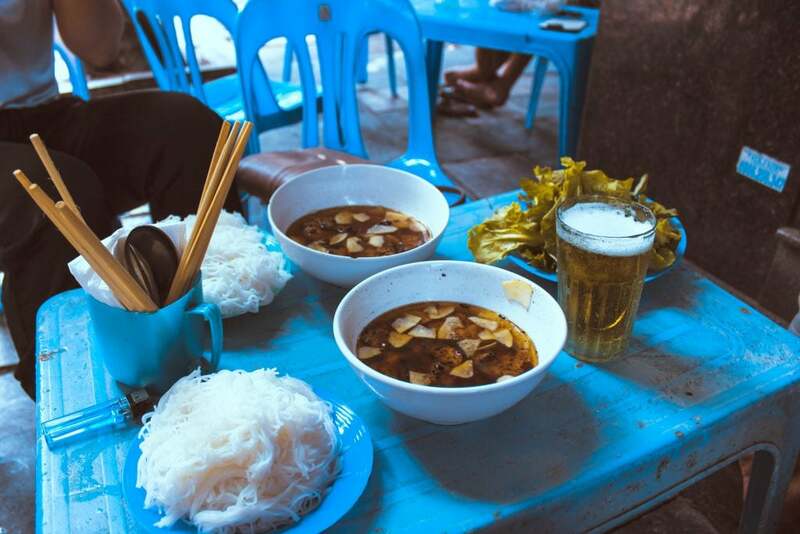 how down a bowl of Pho on your Vietnam honeymoon, this street food in Vietnam is only 40,000 VND! Banh Mi’s were one of the Vietnamese foods that we ate on a regular basis. 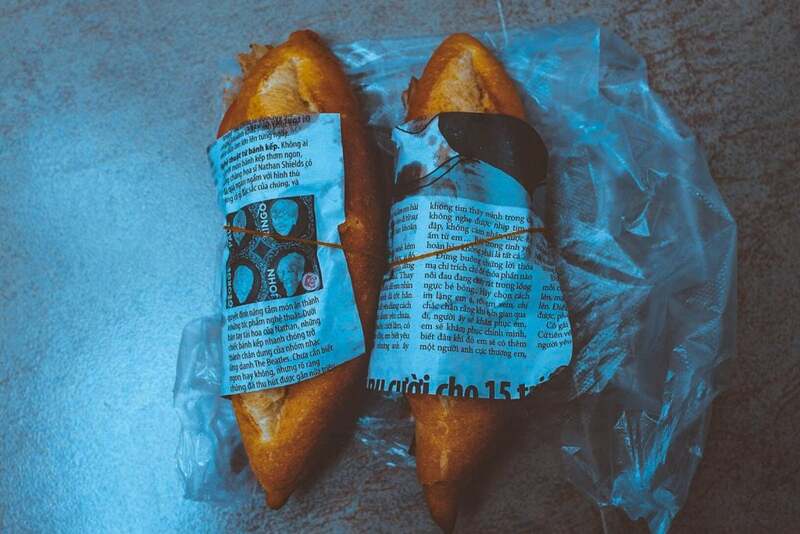 Introduced from the (you guessed it) French, during the colonial period, the Vietnamese have turned these simple baguettes into the best street food in Vietnam. Banh Mi sandwiches may be simple but, they are the best 50c snack you will find when looking for foods in Vietnam. The Vietnamese bread rolls are usually filled with meats like pork belly, fried beef or occasionally you might find chicken. Egg or pate (liver) is probably the most popular Banh Mi toppings. Like most foods from Vietnam, it’s topped with fresh vegetables like coriander, cucumber, radish, chilli and warmed in an oven. Indulge in this famous food of Vietnam for only 10,000 VND a roll on your Vietnam travels! The Vietnamese do simple food in Vietnam so well and Mì Xào is no exception. 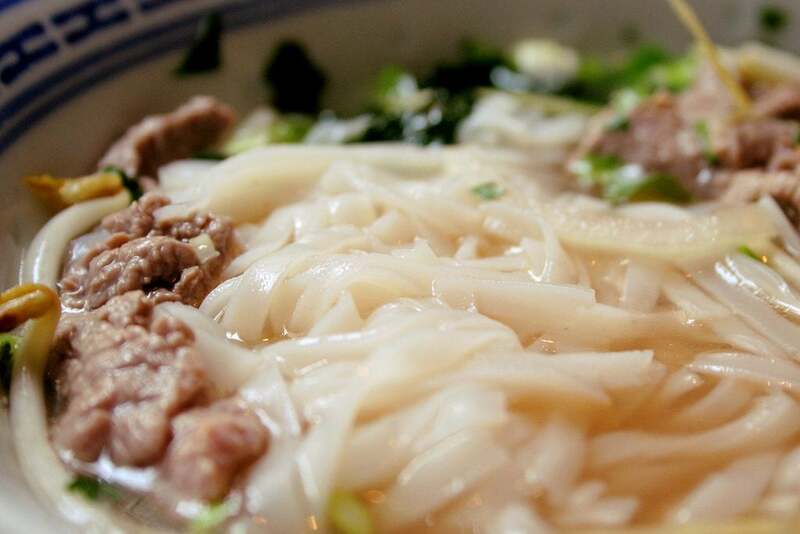 Similar to Phở, Mì Xào can be found pretty much anywhere throughout your Vietnam travels! These delicious foods of Vietnam are just instant noodles thrown into a pan with a dash of oil, onion, morning glory and usually beef (Mì Xào Bò) or chicken (Mì Xào Ga). Just chuck in some tomato to add colour and voila another delicious Vietnamese dish. All the street food in Vietnam is so damn cheap, Mì Xào is no anomaly costing just 50,000 VND. 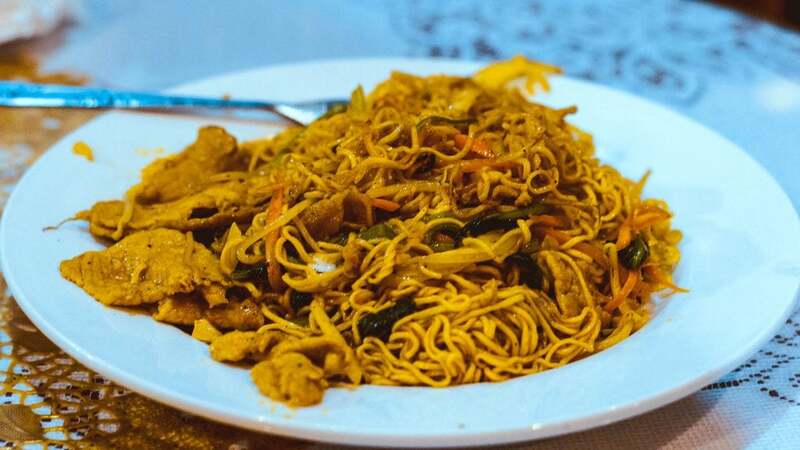 Dylan’s favourite Vietnamese dish – fried noodles! This special food in Vietnam is from the Thanh Hóa province where we lived for 4 months teaching English. Thanh Hóa is where we dived into the bizarre foods Vietnam has to offer. Chả Tôm is made from shrimp that’s smashed into a paste, with pork fat garlic, onion and fish sauce then wrapped with rice paper. This Vietnamese cuisine is cooked with chopsticks over hot coals, served with a papaya salad and fresh greens. Chả Tôm was without a doubt our favourite food in Vietnam and it only costs 50,000 VND per plate. A must try Vietnamese dish when you’re travelling Vietnam. Doesn’t this food in Vietnam look delicious! Bánh Cuốn was our first street food in Vietnam and boy was it delicious. The Vietnamese are so clever with their creations of special food in Vietnam. 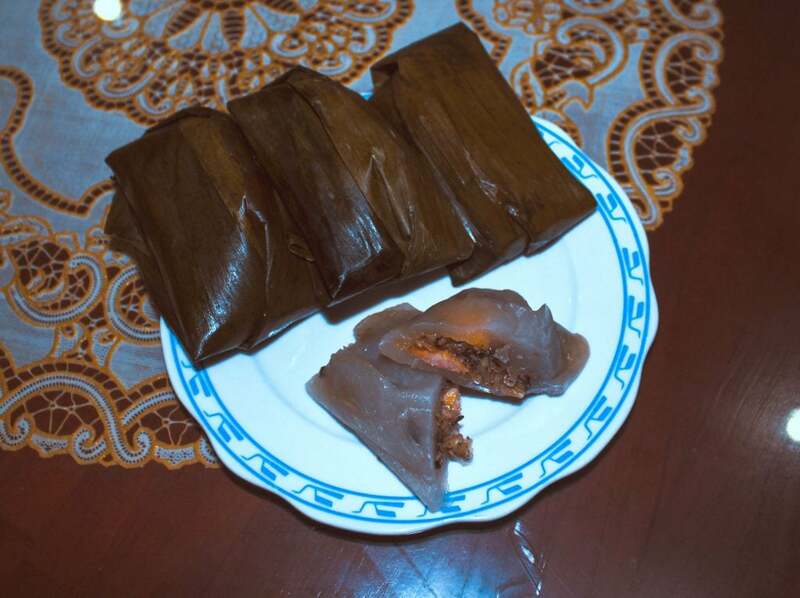 Bánh Cuốn is made from steamed rice sheets, rolled with minced pork, mushroom, and shrimp filling. This delicately wrapped food in Vietnam is served with dried onion and dipped in fish/chilli sauce. It’s easy, quick, cheap and delicious street food in Vietnam, that only sets you back 15,000 VND per plate. All over the country, you’ll find variations of this dish, like Bánh Cuốn Chả which is equally as delicious! This happy lady makes the best banh cuon! Phở may be the most famous food in Vietnam however, in Hanoi Bún Chả is the local dish of choice. Bún Chả is one the best street food from Vietnam. You must try when you’re in Hanoi on your Vietnam honeymoon. I must admit, it’s rather delicious and so damn cheap, just 40,000 VND a bowl. Bun Cha is simple Vietnamese food that combines fresh and savoury with the harmony of meat and vegetables. The Bun Cha broth is sweet, yet sour, served with ‘bun’ rice noodles, bbq grilled pork and fresh greens consisting of fresh lettuce, basil, coriander, mint and banana flower. Make sure you try Hanoi’s signature dish Bún Chả it’s one of the best Vietnamese dishes. This is probably one of the more bizarre foods Vietnam has to offer. Like so much of the street food in Vietnam, this appetizer is wrapped in a banana leaf and originated in Huế. Bánh bột lọc is a clear, chewy tapioca dumpling that’s wrapped up in a banana leaf and steamed. 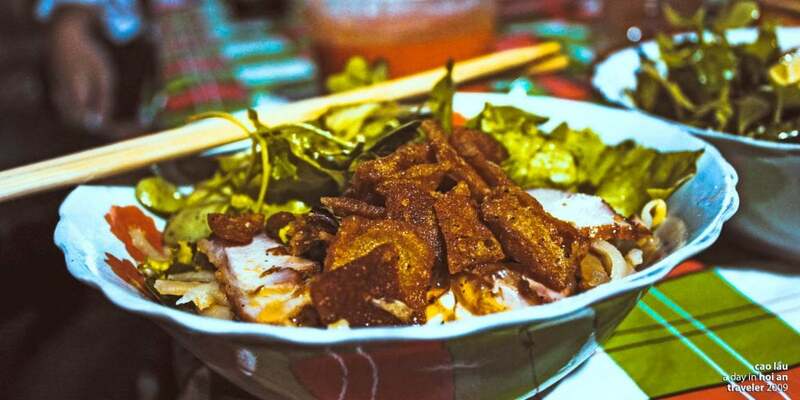 This exotic food in Vietnam is generally filled with shrimp and pork belly. 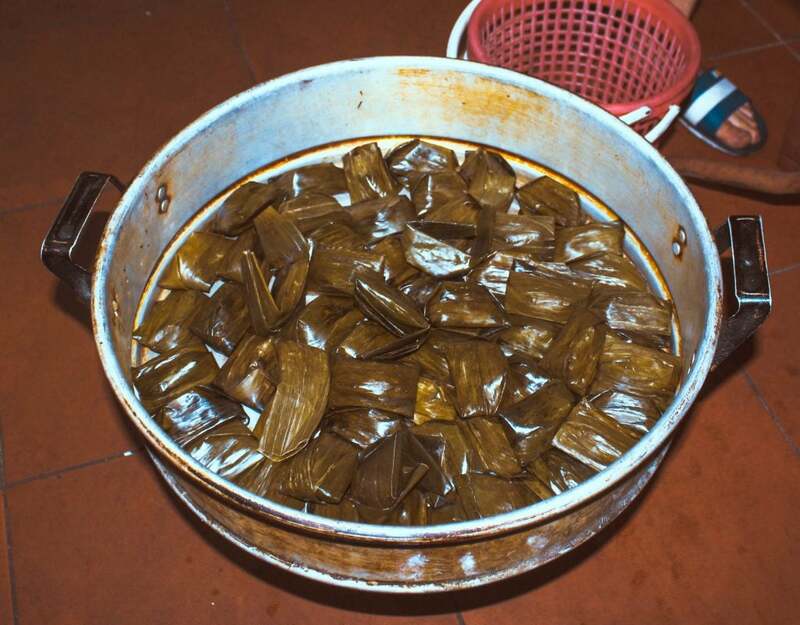 Peel that banana leaf off, dip the small cake in some fish sauce and enjoy! Bánh bột lọc is the best street food in Vietnam! 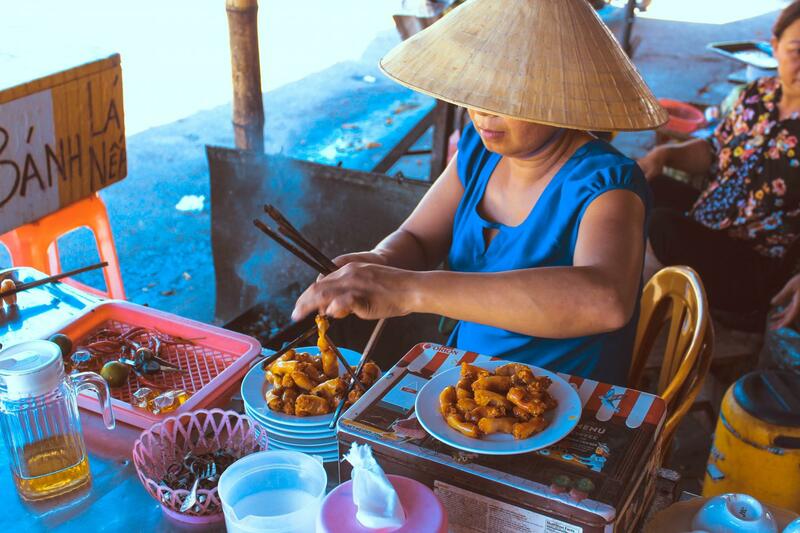 Hoi An has so much delectable Vietnamese food, it’s hard not to try everything! 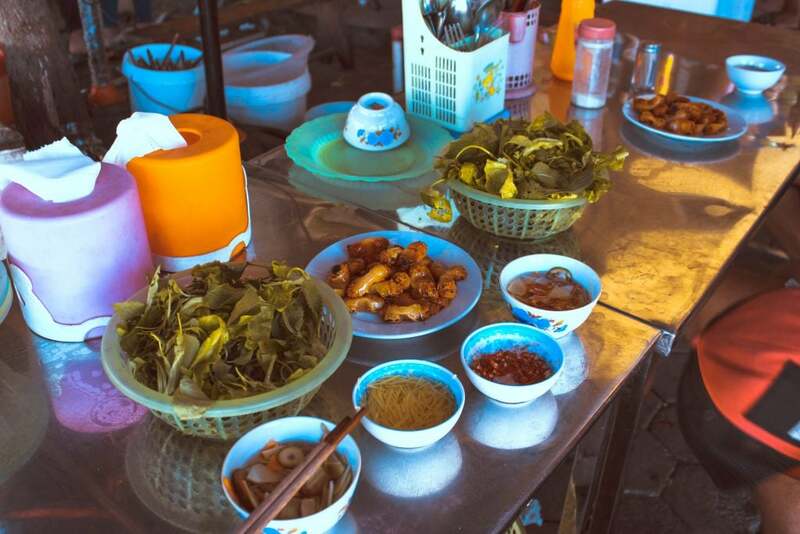 One dish you have to try when you visit Hoi An is Cao Lầu. This signature dish of Hội An was influenced by many cultures who visited when it was a major trading port. 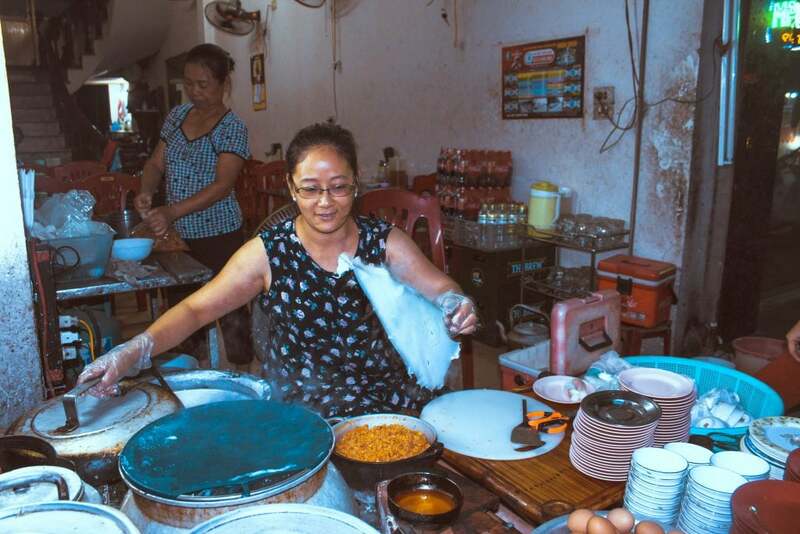 Hoi An and the Quang Nam province is the only place to eat authentic Cao Lầu noodles. If you’re heading to Hoi An, check out this awesome Hoi An travel guide. The thick Cao Lầu noodles are similar to the Japanese Udon noodles, served with crispy won-ton crackers and pork. This food in Vietnam is prepared with water drawn from ancient Cham wells around this region, making this dish very unique! Cao Lau is the pride and joy for locals here in Hoi An, a must try Vietnamese dish for couples on their Vietnam honeymoon. The imperial city of Vietnam; Huế, is home to one of the famous foods of Vietnam, Bún Bò Huế. Bún Bò Huế is a more exciting and colourful version of Phở. This noodle soup has a lot more going on in it than the simple Phở. 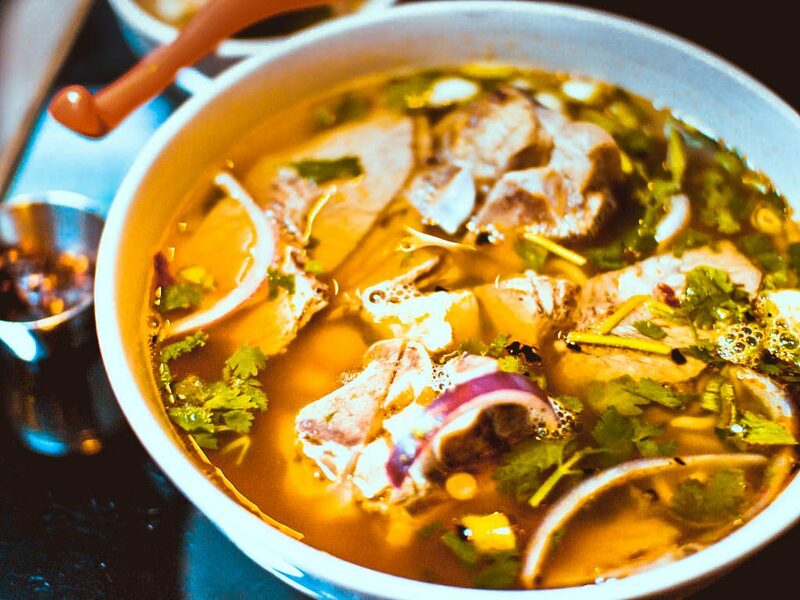 With a rich, strong, spicy broth, a solid kick of lemongrass, traditionally a beef shank and topped with a small amount of braised/raw beef and even some gelatinous pig’s blood. Finished off with some simple herbs, shrimp paste, a squeeze of lime and some weird (I think crab) balls. This deep, rich, satisfying meal will leave you happy and full for a few hours to come that’s for sure! Bun Bo Hue – Hues signature dish! Cơm Bình Dân is a food from Vietnam that is a typical workers meal. We ate Cơm Bình Dân on a daily basis while teaching English in Vietnam. Cơm Bình Dân isn’t one particular food, but a range of Vietnamese dishes with plenty of options to choose from. You generally get a plate of rice and point out a couple of pre-cooked Vietnamese dishes in front of you. These Vietnamese foods range from chicken, pork belly, duck, beef and prawn dishes, to vegetables like morning glory and bamboo shoots. If you’re into exotic Vietnamese dishes, they also have cow tongue, crickets and other bugs and strange vegetables that are poisonous if you eat too much of it! Cơm Bình Dân may be simple foods from Vietnam, but you’re totally missing out if you don’t try this authentic Vietnamese experience. If you make your way to one of these local Cơm Bình Dân eateries for lunch or dinner you are in for a real Vietnamese cultured meal. 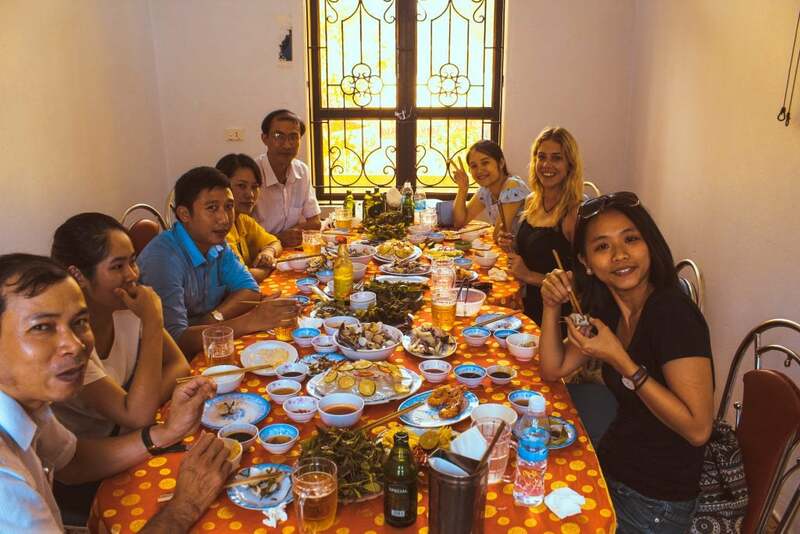 Chances are you will be ‘invited’ to sit with some locals, people will try to make you drink beer and Rượu (rice wine) with them. 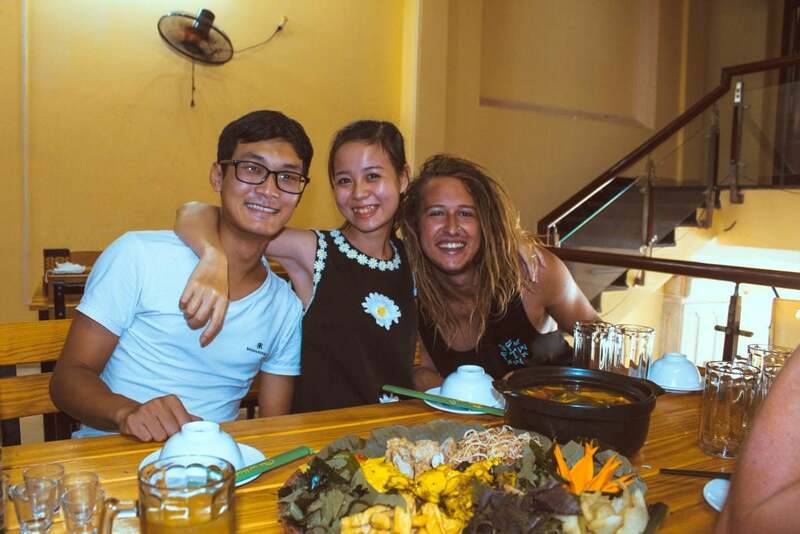 The Vietnamese love a good photo opp, especially with foreigners so be prepared to take a couple of selfies with your new friends. 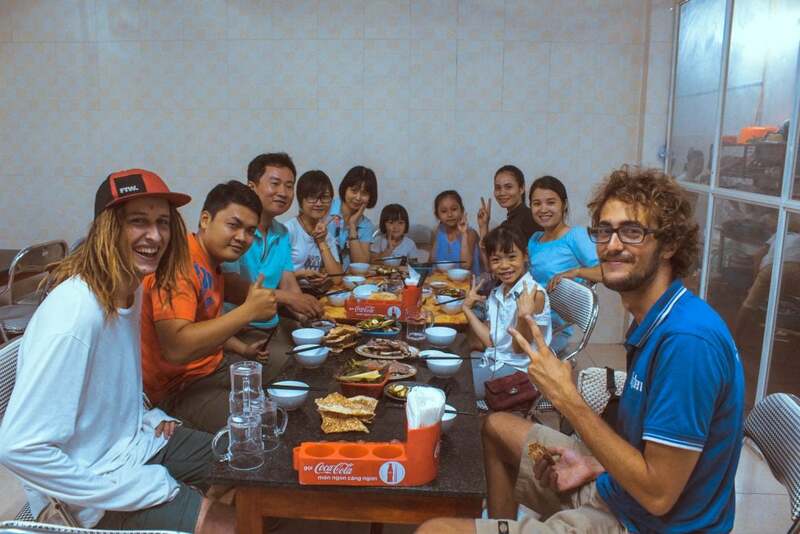 Round up some friends for an authentic food experience, enjoying a Vietnamese Lẩu. This is definitely one of the more social foods from Vietnam, with everyone digging into the one big hotpot. You’ll be given a big pot of soup that will be kept simmering over coals on your table. Accompanying this oversized soup will be an abundance of vegetables, greens, herbs, rice noodles and your choice of main. You can typically choose from beef, pork, chicken, frog, or whatever other odd animals are on your Vietnamese food menu. If you’re adventurous enough, try the frog (ếch)! Our local buddy took us out for Lẩu ếch and it was surprisingly delicious food from Vietnam! Gỏi Cuốn is a healthier alternative to the fried spring rolls (Chả Giò), they’re both common foods from Vietnam and can be found throughout the country. These light, fresh spring rolls are made from translucent rice paper rolls filled with greens, a slither of pork or some shrimp and a layer of coriander. Most regions of the country will slightly differ their Gỏi Cuốn, but they’re definitely a popular food from Vietnam amongst travellers! Dip your Gỏi Cuốn in a delicious fish and peanut sauce that accompanies your spring rolls. Roll your own fresh spring rolls – YUM! This crispy, savoury, crepe-like food in Vietnam is best enjoyed fresh and hot out of the pan! Made from rice flour, coconut milk, turmeric and generally bulging with shrimp, pork and some bean sprouts. This delicious food from Vietnam shouldn’t be missed. Topped and garnished with fresh herbs. Cut this food in Vietnam up into smaller, more manageable pieces, then wrap it up in a lettuce leaf like a local and enjoy the best savoury pancake you’ve ever had! 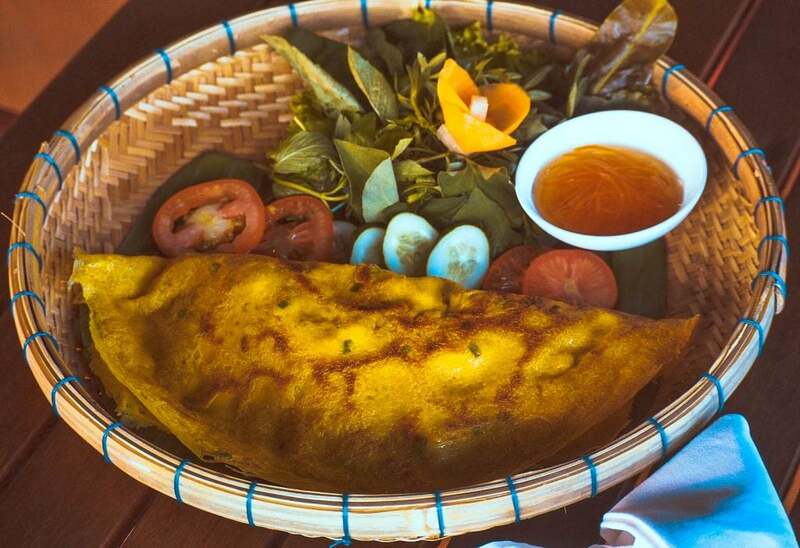 This Vietnamese crepe/omelette is a breakfast favourite! 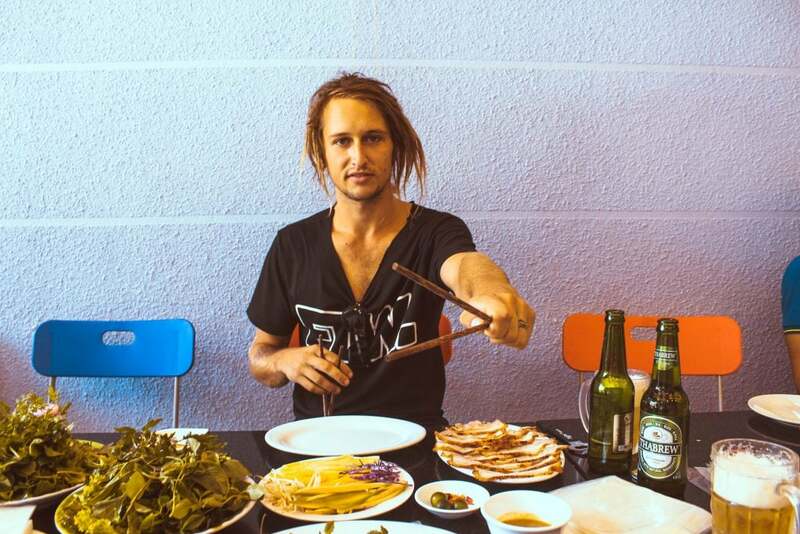 If you’re eating food in Vietnam it only makes sense to accompany it with beer! Especially when Bia Hoi is cheaper than a bottle of water or pop. Bia Hoi is fresh beer that’s made each night and won’t last more than 24-hours, as it has no preservatives. Since it doesn’t last, they sell it for a ridiculously cheap price, costing 25 cents a beer. You will find this incredible liquid all over Hanoi, Saigon and many other parts of Vietnam. There is no better place to be introduced to Bia Hoi than the Old Quarter of Hanoi down Tạ Hiện Street. Now Bia Tươi is also fresh beer but it will last a few more days and apparently tends to get better each day. We were never able to save any, so not too sure how much better it could have got… Just don’t leave it more than 6 days as it starts to go bad around then. Bia Tươi is usually sold from small, local stores for about 50c a Liter. The beer will be poured into a ‘jerry can’ container that looks like it would normally be used for petrol! Don’t worry though, they are cleaned thoroughly (to Vietnamese standards) and is some of the best beer we had for that price. 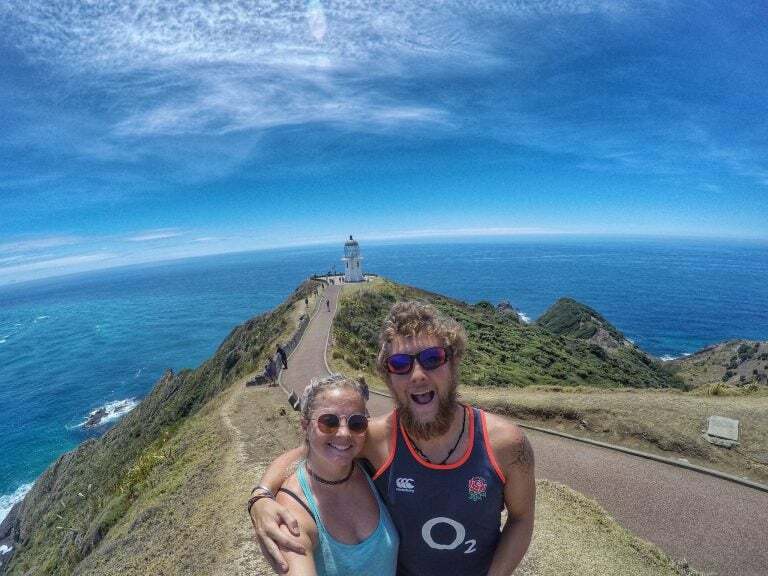 Enjoying Bia Hoi with an epic view! If you enjoy a good, strong coffee then you have come to the right country! Vietnamese coffee is by far some of the best coffee in the world. 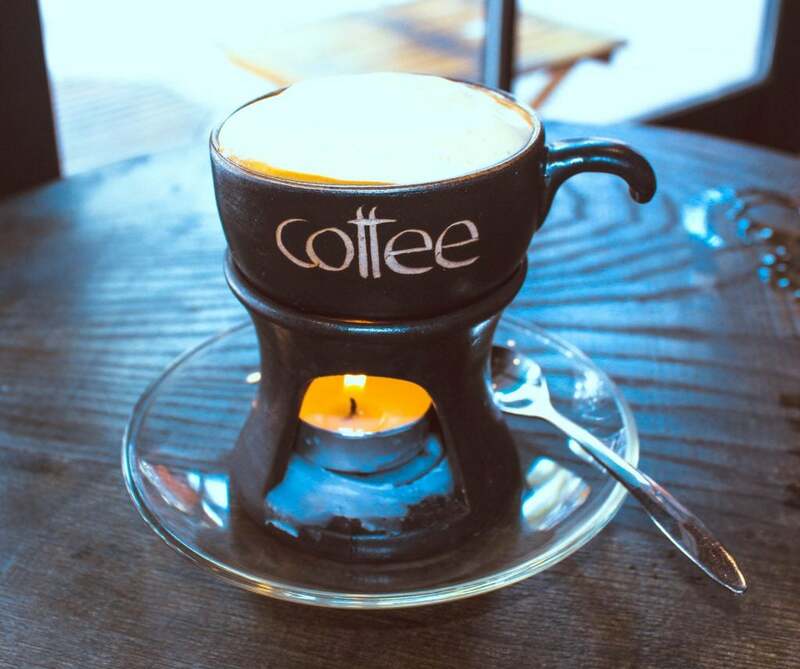 Coffee in Vietnam isn’t like your regular coffee you’ll get back home, as it’s much sweeter! Hanoi’s ‘Cafe Giang’ is world famous for its Cà Phê Trứng aka egg coffee. Cà Phê Trứng, originated from Nguyen Giang when milk was scarce in Vietnam. Giang simply used egg yolks as a replacement. He soon came up with the recipe of egg yolks, sugar and coffee. The coffee is brewed in a small cup with a filter before adding the perfectly whisked combination of beaten yolks, sugar and condensed milk. You get a bold coffee flavour with the sweetness of egg mixture, which makes for an odd yet brilliant coffee experience in Vietnam! Vietnam is one incredible country, you should definitely explore. It’s home to delicious food in Vietnam and many incredible honeymoon destinations. 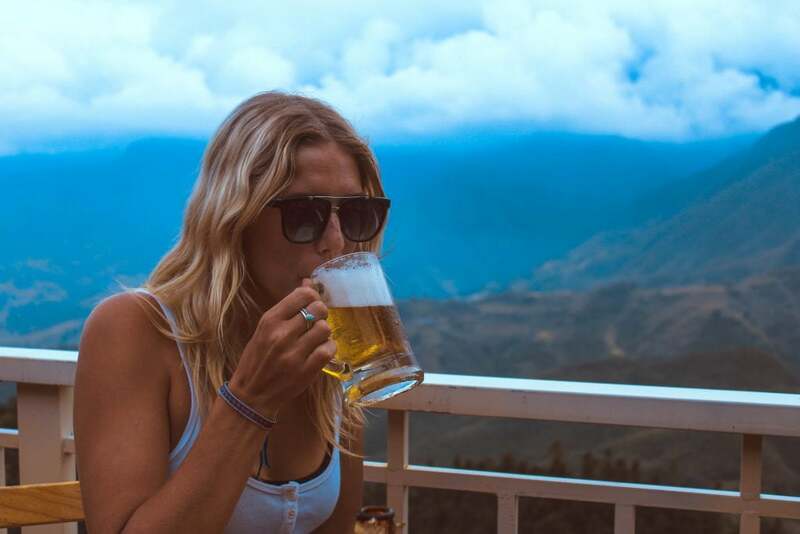 Have your honeymoon in Vietnam and follow our ultimate Vietnam guide for the best destinations and attractions in Vietnam. 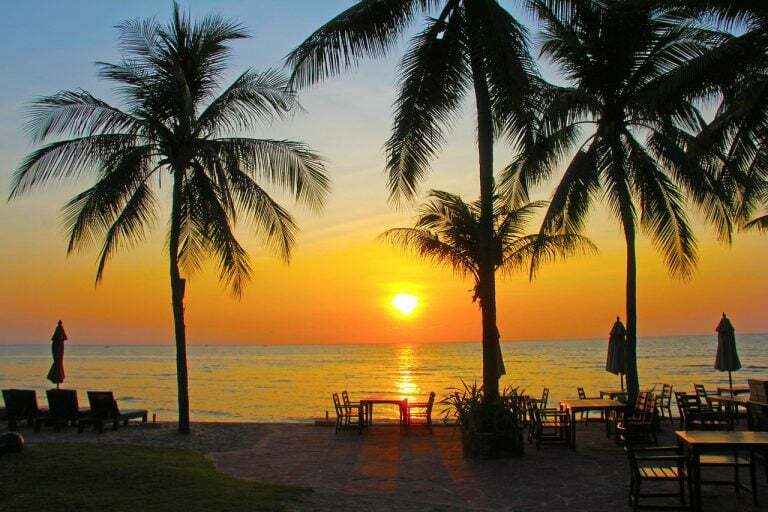 Check out our full Vietnam travel guide, full of tips and advice for honeymooners and couples. We love the street food in Vietnam!